Chic, classic and refreshed for the new year, Anh created this lived-in, choppy and layered cut for a look that can be worn with minimal styling and that will grown out seamlessly. 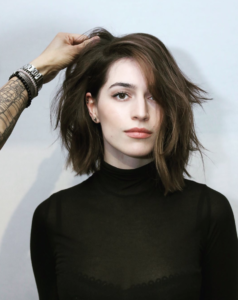 This cut was styled by establishing a deep side part after giving the hair a rough blow dry with the head flipped. Start from the bottom up using the Nu Wave technique and follow up with the Lived In technique, alternating waves to create a more natural movement. After the entire head is waved, apply a nickel size amount of DePolish from L’Oreal Professionnel from roots to ends for body and separation. Seal the deal with Infinium4 for hold.